Really, most of us just focus on what’s in front of us. We’re too busy putting out the fires of everyday life. I work best after the deadline has passed, when I’m in a panic. I have panicked on a few jobs through the years but I lived to tell about it. 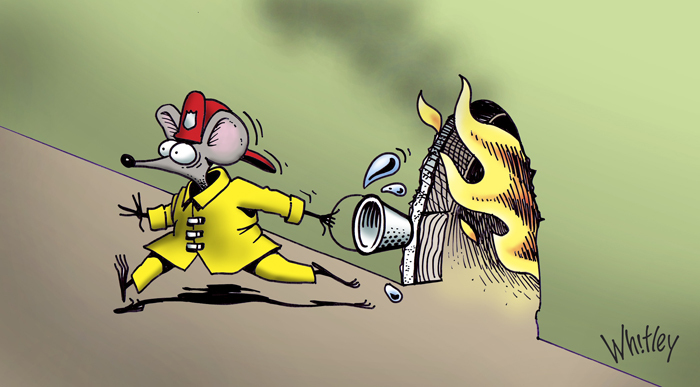 Now I have Mister Fire Mouse to do it for me. Please like and share this post. Thanks! P.S. I’m calling on all Grammar Police and Spelling Wizards to comment on any errors or omissions you may find in any of my posts. It will help make me a better writer, give me a thicker skin and bring a bright smile to your face knowing you have once again rescued the english language from certain annihilation. ← What does this have to do with art? About being creative. My favorite expression while at work was: lack of planning on your part does not constitute an emergency on my part! Like those comments nice to see that stars, poets and even politicians have fear, panic and deadlines.